It's more than food. It's a lot of fellowship. E-R photo from 2014 bazaar. It’s uniquely ours and it’s about to happen again. 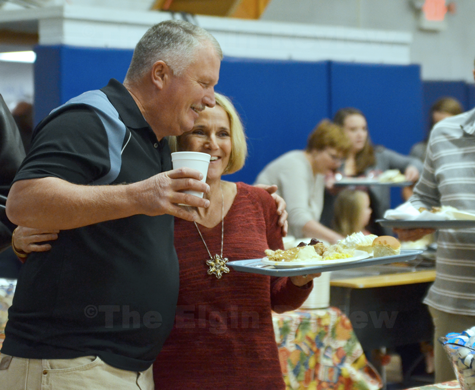 The 91st annual Thanksgiving Bazaar will be held Thursday at the St. Boniface Gymnasium. More than 1,000 people will come from near and far to partake in the bazaar hosted by St. Boniface Catholic Church. Generation after generation have enjoyed Thanksgiving dinner with their friends and neighbors in Elgin. Serving begins at 11 a.m. Thanksgiving Day. Serving will continue til 2:30 p.m.
“The good Lord takes care of it,” committee chairperson Sandy Kallhoff said Sunday night when asked about preparations. She explained that, every year, the questions of “Is there enough food? Is there too much food?” are asked but one can never know until its done for another year. “Our numbers (of attendance) continue to hold fairly steady,” she said. On the menu? Turkey & dressing, original special recipe sausage, mashed potatoes & gravy, sauerkraut & ribs, cranberries, gelatin salad, corn, dinner roll, homemade pies and desserts. Anyone homebound or would like a Thanksgiving meal to be delivered should contact Deb or Kyle Warren at (402) 843-2283 before Thursday. There will also be bingo, games, raffles and a country store. Bingo will be held in the church basement from 11:30 a.m. to 3:30 p.m. (including games for small children). Raffle drawings will begin at 4 p.m. If you’ve been thinking about attending, start this year!